Ninkasi Brewing of Eugene, Oregon is our next stop on our beer tour of Oregon. I have seen this brewery many times as it has a kind of cult following here in the Willamette Valley. I’ve even seen their beer in Costco and have been curious about the brand. This review will be the first of three reviews of ales I bought that are from Ninkasi. If there’s a specific brew you think I should check out form Ninkasi, please leave a comment below or get in touch with me otherwise. 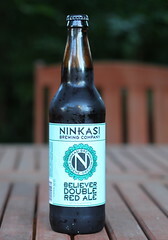 Ninkasi Believer Double Red Ale is an interesting beast. When I first poured it, I thought it would be IPA-like in flavor. I could immediately smell the hops and other floral scents when I poured this very dark copper colored ale into the pint glass. For those doing their homework, Believer Double Red is 6.7% alcohol and has 60 IBUs, putting it dead center in the ‘bitterness’ category of ales. Ninkasi started brewing this beer in 2006 and it’s one of the company’s more popular brews. How does it taste? In a word: majestic. Believer Double Red has a bit of hoppyness, just enough to be present but not too much that it overwhelms. What is most notable is the malty overtones that persist through your entire sip of this red ale. This is not a complex tasting beer – rather it’s a very nice balance of bitterness and malty smoothness. If you like a good, medium-strong ale, you’ll like Believer Double Red. Any amber ale fan who craves a bit more flavor will go nuts for this beer. I hope you enjoy it! gotta try the seasonal “maiden the shade”. simply awesome. Thanks for the idea – I’ll check it out! Is this rumor about Ninkasi 6-ers true?